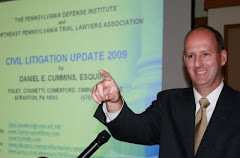 Here is a link to a May 26, 2011 article by Erin L. Nissley of Scranton's The Times-Tribune reporting on the decline of medical malpractice cases across the Commonwealth of Pennsylvania based upon tort reform measures. Also mentioned in the article is the current status of another tort reform measure currently making its way through Harrisburg, the Fair Share Act under which, in most cases, each defendant in a multiple defendant lawsuit will only be responsible to pay the percentage of liability assessed to that defendant by a jury. Under the current status of Pennsylvania law, any defendant hit with even only 1% of the percentage of liability is responsible to pay the entire verdict to an injured party (and thereafter pursue the co-defendants for a reimbursement if desired).